I’m very grateful that my family encouraged me from a young age to embrace travel in all its forms. We traveled to Cameroon many times when I was younger to visit extended family and we additionally made trips to France, the UK, and Canada. 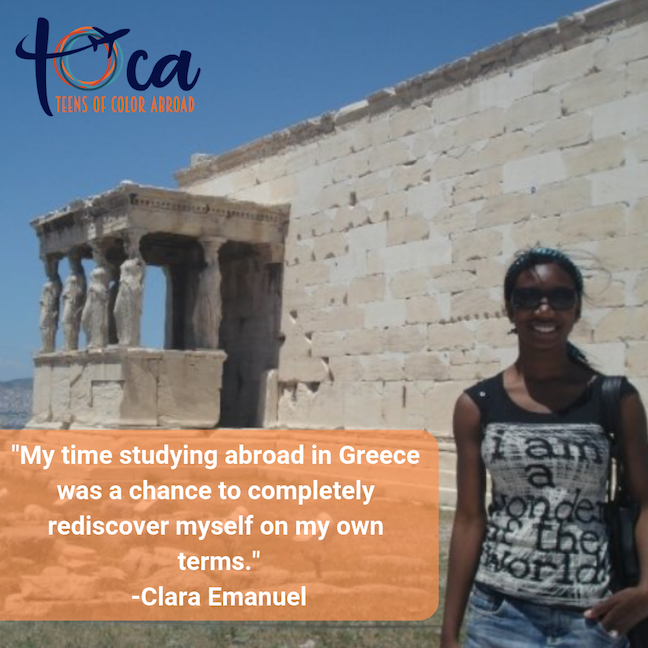 However, my time studying abroad in Athens, Greece for six months during university was easily the most important travel experience of my life. This was a chance to completely rediscover myself on my own terms. I was fully thrust out of my comfort zone and I had to immerse myself in the language, including a new alphabet, in a place that I knew nothing about (except for the myths and tales of the ancients that I read about in school). It was such a liberating and freeing experience. I made amazing connections, ate some incredible Greek food, ran with the official Olympic torch in Olympia, and stood on the steps of the birthplace of Western storytelling. As a black woman who now works in film, TV and entertainment, it was simply an experience that I will always treasure. After university I knew I wanted to come back to Europe, and I’ve been living in London for the past 10 years. I now see the world, and myself, so differently because of my immersive study abroad experience and I will always encourage young people to step outside their doorstep to wander into worlds unknown. Your adventure is waiting for you.